Zaidett Barrientos have made an important contribution to the ecology of Neotropical snails to study the ecology and biology of Drymaeus tripictus (Albers, 1857) in Costa Rica. The abstract of the recent paper is as follows: “Very little is known about the ecology and biology of Drymaeus tripictus, an extremely rare and endemic land snail species from Costa Rican highlands. I studied the ecology and reproductive biology of D. tripictus from April 2009 through June 2010 in an old forest, a young forest and a Cupressus lusitanica plantation in central Costa Rica. Every three months I visited each habitat and collected specimens in 20 random sampling plots (3×3 m2 each). I observed the snail’s activity and microhabitat preference in the field, and in the labora- tory I recorded high definition videos of its mating behavior and analyzed reproductive morphology with light microscopy. The snail is more abundant in the old forest (0.017 ind./m2) and prefers leaves with little epiphyllous cover (0-25 % cover, chi-square test, p <0.0001). During the dry season the snails become active between 20:00 pm and 8:00 am (chi-square = 22.65, df=3, p < 0.0001); they are inactive mainly during the afternoon (11:00 am to 16:59 pm). I found active individuals mostly on the upper side of leaves, where they feed (Chi-square =6.76, df=1, p = 0.0093). Mating is unilateral, by shell mounting, with cryptic phallus intromission and without role switching or multiple mating. Its reproductive system is morphologically similar to that of Drymaeus costaricensis. 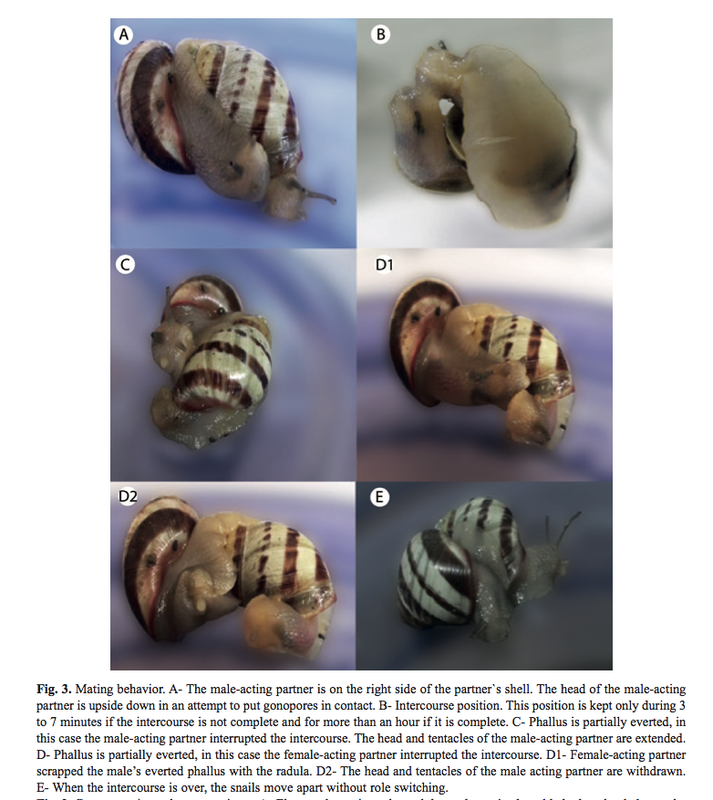 Mating behavior is as expected for snails with high-spired shells, except for the lack of role switching. The density of D. tripictus is low even when compared with other endangered bulimulids”. A very interesting paper, which I had the pleasure to review as a draft (although not acknowledged). Barrientos, Z., 2016. Reproductive system, mating behavior and basic ecology of an extremely rare tropical snail: Drymaeus tripictus (Stylommatophora: Bulimulidae). – Revista de Biología Tropical, 64(1): 55–68. This entry was posted in Uncategorized and tagged costa rica, drymaeus, ecology, literature on December 1, 2016 by bramb.